Wow, lots of coaches. Just wondering, for standard, are there any that can be omitted? 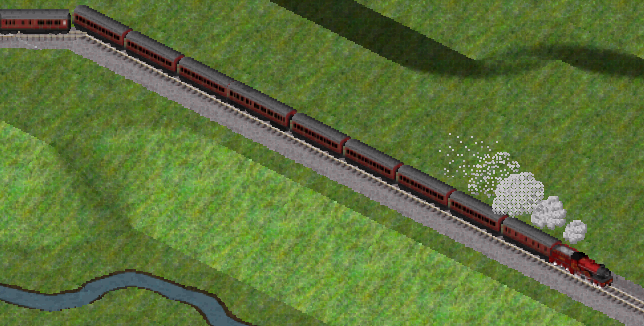 I'm a little concerned about a confusing surfeit of lots of rolling stock (without the variances in comfort), e.g. lavatory, non-lavatory, corridor etc, or suburban vs long distance. Also, how should these new LNWR coaches (for example) relate to the existing catch-all clerestory stock? Hmm, this is a complicated question! As you will see from Github, there are more carriages on there that I have not yet got around to putting on this thread. The additional carriages are intended to fill in gaps in the timeline of Pak128.Britain-Ex, and the variety is indeed designed to suit the features of Experimental. I'm not really sure how Standard balances with vehicles, especially unpowered vehicles, so it's rather hard to tell what would be a good policy. A few thoughts that might help, however, to form a germ of an idea. Firstly, a number of the new items are time separated rather than role separated. For example, the LNWR 32ft radial six wheelers, LNWR radial carriages, the LNWR 42ft bogie corridor carriages, the LNWR 50ft corridor carriages and the LNWR 57ft corridor carriages all mark a smooth transition of long distance stock from the 1880s to the beginning of the 1920s. All of those carriages have the same role - long distance express work - and all are of the same company, the LNWR. Standard has/had just the (one set of) LNWR six wheelers and no later LNWR carriages until my 42ft 8 wheel radial carriages were added a few months ago. Where things are separate in time, there is less harm in having lots of them, as only one set is exposed to the player at any one time. (As to the clerestories - the LNWR never had any of those apart from dining cars - of which there is not much use in Standard - so these do not fit into the LNWR's history; for reference, the LNWR went from arc roof carriages, through a short spell of cove roof types i n the 1900s (which I have omitted for simplicity) to the modern elliptical roof design, the cove roof and later types all having the wider body that enabled an extra passenger's width per row of seats than earlier carriages). Where there may be less use for Standard carriages are the suburban types and lavatory upgrades of existing carriages, as well as the lavatory/non-lavatory distinction. Which to adopt is very difficult to judge (the anomalies created by having to make that sort of decision is one of the reasons for Experimental in the first place), but being consistent in what sort of things to leave out is probably a good (if incomplete) guide as to how to go about it. It gets more complicated, however, if one considers the needs/desires of sandbox players who are not concerned for the vehicles to have economic significance, but wish for their trains to look historically accurate. I do not know to what extent, if at all, you want the Standard version of the pakset to cater for this audience, but I note that some dining cars seem to have been produced for Standard which seem to me to fall into this category. I hope that this goes some way towards helping, at least! Generally for standard I would suggest plain, brake and restaurant versions only. 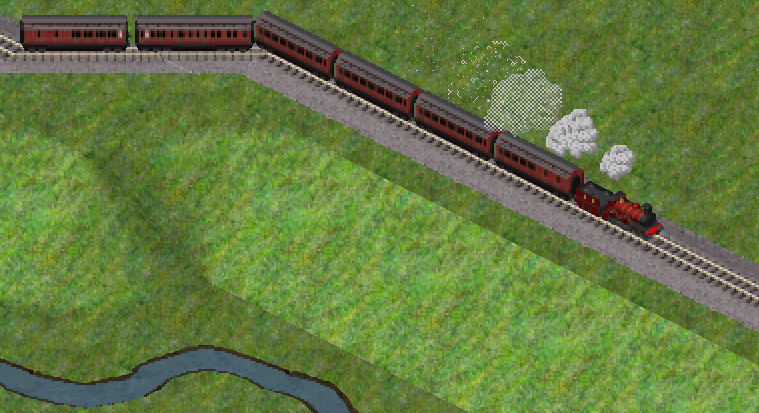 At least one short, medium and long distance carriage type should be available throughout the timeline, though I'm not convinced that we need to have a range from each railway company (especially pre grouping!). I Live change in Trains. 1) At present we have (for passengers) "normal", brake and restaurants for most stock. The need for restaurants is debateable - they have no function in standard and have a lower capacity per unit length than a normal carriage. I quite like the idea of ending on a brake as we currently have it, so that will probably stay. Should we be worried about dining cars though? Existing ones could be removed and normal versions used instead using compat.tab. 2) Long/medium/short distance - how would these be distinguished? If by capacity alone, then it would make sense to always choose the highest capacity. Suburbans could be speed-restricted however? Since faster locos have much higher maintenance costs (due to speed bonus) that would necessitate faster rolling stock for these locos. Thoughts? 3) Lavatory/non-lavatory/corridor etc. - we can choose fairly arbitrarily. I wouldn't see the need for multiple versions (except sandbox players particularly interested in this thing, who could always download the graphics from experimental anyway). 4) Liveries - I would disagree with kierongreen here, mainly because I like the carriages to "look right" with the loco for a particular train. For me that means having crimson coaches with MR locos and choc/cream ones with LNWR, hence the discinction of my catch-all clerestories by livery rather than company. I'm not fussed by the detail in point 3 however - that's a micromanagement level I'm not into. I'd be interested in what other players felt though. 5) Timeline - as long as there isn't too much overlap between the different coaches, I don't see such a problem with having lots of different types of carriage in a continuous timeline - depot clutter is always a problem with timeline on and the pak is not intended for playing with timeline off anyway. Very happy to discuss each of these points (and more) if people have other views. This is not straightforward as many distinctions don't work in Standard. As to long distance, intermediate distance and suburban: generally, before the 1930s and after about the 1900s at least, long distance carriages tended to be corridor carriages, intermediate distance were lavatory non-corridor and suburban carriages were non-lavatory non-corridor. Earlier, there were no corridor carriages and the long distance carriages were also lavatory non-corridor. Before the 1880s, there were no lavatories at all, and before the 1860s, there was no distinction at all between different distances. After the 1930s, the lavatory non-corridor slowly disappeared, to be replaced on intermediate distance services by corridor carriages. After the 1955 modernisation plan, multiple units became prevalent for all but long distance services, but we have those covered in any case. You'll have to decide what you want to represent. The issue of long distance, intermediate distance and suburban therefore overlaps completely with the issue about lavatory, corridor and non-corridor stock. The suggestion of having suburban/intermediate stock have a lower speed limit for Standard is not a bad idea - perhaps adding a comment to the .dat file to explain that it's not a realistic speed limit, but some Standard specific speed bonus balancing. That still won't do much for cascading, but that's not practical in Standard anyway given the lack of a replacer. It might be best to be rid of the restaurants in Standard, as they have no function and might confuse players. You could perhaps provide a pak with the Standard versions of all the extraneous vehicles from Experimental that have no economic function in Standard as an addon for people who care about these things. I like the carriages to "look right" with the loco for a particular train. I'd go one step further and say a pak for just the restaurant carriages. Other paks could be made available for variations on liveries, a wider variety of vehicles and so on. That way people can be more selective about what they add. Suburbans could be speed-restricted however? Indeed - from the beginning the general idea was suburban would have high acceleration, low top speed, long distance the other way round, reflecting real life. That still won't do much for cascading, but that's not practical in Standard anyway given the lack of a replacer. Hmm, I'm beginning to think it's time to split off a core vehicle set from various add-ons - I've been thinking about this for a while. At present I think only trains would be affected by this; there aren't too many buses/trucks and air and boat are not complete yet. I'll start a new thread about this and we can continue discussion there. Another question - which of your new carriages is intended to replace the "1847" LNWR carriages? I can't find any with an intro date that early. Ahh, this gets slightly complicated. My research indicates that the differences in carriages styles from the early 1830s right until the 1850s differed very little, and that they were also the same size, so, instead of having new carriages in the 1840s, I have just given new liveries to the 1830s LMR carriages, which are now also available in LNWR and MR liveries, and put in new carriages in the 1850s. Those 1850s carriages I had originally built to replace the 1847 carriages, so you can use those if you'd prefer. Thanks - that's helpful. Did you get my email with all the other questions and spreadsheet? And another point (just for reference if necessary) - there seems to be a gap in MR carriages between 1896 and 1913 (and 1913 onwards for corridor stock?) - is this me missing it, deliberate, or just not filled in yet? And another question - what is the difference between your LNWR 6 wheel radials and the existing 6 wheelers? Should I replace the existing ones? 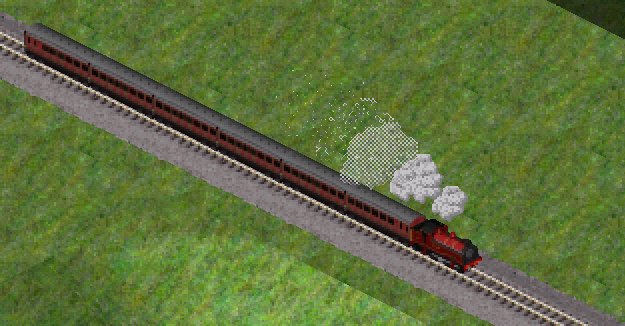 The old graphics for the LNWR 6 wheel carriages appear to be based on the shape of the GNR six wheelers, and don't look anything like carriages actually used by the LNWR. They have been replaced in the Experimental version with two different types of 6 wheel carriages - the 32ft radial types from the 1870s and the 30ft 1in non-radial types from the 1880s (which type of carriage was the most numerous type ever built by any British railway ever). The earlier types were at the time the railway's staple long distance stock, but, by the 1880s, the 8 wheel radials had taken that role, so the shorter non-radial 6 wheelers were built for lesser trains, albeit often secondary long distance expresses (it was to be some years before such types were confined to suburban/branch line work). It should be noted that this in itself represents a substantial simplification of the picture, with other carriages of 30'0", 33' and other such things also being built. I have estimated for the purposes of Experimental that the earlier type was both more comfortable and more expensive than the simpler fixed chassis type. In Standard, it being later and less expensive to build/run might be sufficient differentiation from the earlier stock. Thanks. 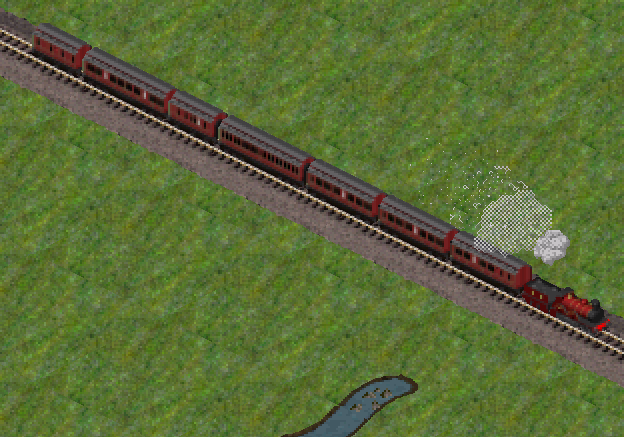 I am currently working through a complete revamp of the standard set rolling stock to simplify appearance in the depot. I'm removing a few of the generic carriages which you have done replacements for in the process. As usual, the .dat files and translation texts are on Github. Dat files don't appear to be all on github? Hmm, odd. Which ones are you missing? Found them now. I've noticed the mail capacities are huge (several hundred per carriage) - unless you've rewritten the mail generation code this is probably not desirable - I've been working on the assumption that mail capacity should be similar to passenger capacity given the relative generation rates of units of passengers and mail in game. Ahh, yes, I have indeed changed the mail generation code in Experimental, and also changed mail from being measured in "bags" to "bundles", each weighing 1/10th as much and producing 1/10th of the revenue of the former "bags" of mail, so the capacities are increased by 10 to compensate. You can either implement this change in Standard, or adapt the Experimental capacities by dividing by 10. Actually, implementing this would not require a code change in Standard: if anything, it would balance better with Standard. The problem currently is that there is far too much mail generated per passenger: an entire bag of mail for every three passengers(!). In Experimental, I have done two things to change this: (1) change the code to reduce the ratio of units of mail to units of passengers considerably; and (2) change the value of units of mail to make the amount of mail that they represent ten times smaller. Each of these things alone is a worthwhile step, although they are even better in combination. The result of implementing this in Standard, however, will be that there will be a tenth of a bag of mail generated for every three passengers, rather than a whole bag of mail, which, while still excessive, is not as bad as before. So you are suggesting that, although the amount of mail generated by standard (without a code change) would be the same (in terms of mail quanta in the game) but each quantum would be worth 1/10 and therefore you would need approx 1/10 the number of convoys to carry the same amount of mail generated? Worth considering given the amount of mail generated in the forthcoming rebalance. I have been working lately on (finally) finishing the work on the Midland carriages that I had started over a year ago. These new carriages represent the period from 1896 until the end of the Midland's independent existence in 1923, and incorporate the famous "clerestory" carriages of the late 1890s and early 1900s. All the work is on my Github repository for Experimental, which has all the .dat files and .pngs. I thought that it would be better, instead of posting each graphic file to this thread, given that they are already on Github, to post some images of the new carriages in action. It looks like one of the pixels could get shifted over to the right and down to make the edge look less "jagged". That is just a scaling artefact present because the image was captured at an intermediate zoom level. At a 1:1 zoom level, or a 2:1 zoom level (as for all the other pictures), these artefacts are not present. Gotcha... didn't notice it wasn't a 1:1 zoom level.